I want to be remembered for my dreams. When the soldiers came to Jesus, they saw that He was already dead so that they did not break His legs, but one of them opened His side with a lance, and immediately there came out Blood and Water. Joseph of Arimathea, because he was a disciple of Jesus (although a secret one for fear of the Jews), besought Pilate that he might take away the body of Jesus. And Pilate gave permission. The body of Jesus was then taken down from the Cross and laid in the arms of His sorrowful mother. Later Joseph from the city of Arimathea asked Pilate to let him remove Jesus’ body. (Joseph was a disciple of Jesus but secretly because he was afraid of the Jews). Pilate gave him permission to remove Jesus’ body. So Joseph removed it. Nicodemus, the one who had first come to Jesus at night, went with Joseph and brought 75 pounds of a myrrh and aloe mixture. These two men took the body of Jesus and bound it with strips of linen. They laced the strips with spices. This was the Jewish custom for burial. A garden was located in the place where Jesus was crucified. In that garden was a new tomb in which no one had yet been placed. Joseph and Nicodemus put Jesus in that tomb, since that day was the Jewish day of preparation and since the tomb was nearby. There is a strong correspondence between the crucifixion of Christ and the most recent murder of an international in Gaza, Vittorio (Vik) Arrigoni, allegedly by a radical Islamic Palestinian group. I have noticed a similar correspondence for years between Christ and Martin Luther King Jr; Mary Dyer, the Quaker hanged on Boston Common for her support of religious freedom; and Rachel Corrie, killed by Israelis while protecting a Palestinian home about to be demolished in Gaza, each a martyr dying for a conviction. As Dr King said, Those who have nothing they’re willing to die for are not fit to live. Joseph of Arimathea retrieved and began the burial preparation of Jesus. How did Mary, the mother of Jesus, feel when she received her son’s body? Vik’s mother was far away in his homeland, Italy. So Palestinians placed his body in a coffin and carried it thru the streets of Gaza, finally giving it a symbolic burial. It was transported to Italy for the actual burial. One has to die to become a hero, to hit the headlines and to have TV crews around the house, but does one have to die to stay human? I recall Vittorio in the Christmas of 2005, detained and incarcerated in the Ben Gurion Airport, the scars left by the handcuffs that cut his wrists, the denial of any contact with the consulate, the farcical process. And I recall Easter that same year, when just across the Allenby Bridge at the Jordanian border the Israeli police blocked his entrance in the country, put him on a bus and, seven against one (one of the seven was a policewoman), they beat him up “with skill”, without leaving any external marks, like the real professionals they are, then hurling him to the ground and throwing at his face, as a last scar to add to the others, the hair they had ripped off him with their machines. Vittorio was unwanted in Israel. Too subversive, for having joined his friend Gabriele one year earlier and demonstrated along with the women and men of the village of Budrus against the Wall of Shame, teaching them the lyrics and singing together our most beautiful partisan song ‘O bella ciao, ciao…’. Back then no TV crew came by, not even when in the Fall of 2008 a commando attacked in Palestinian waters off Rafah the fishing boat he had boarded. 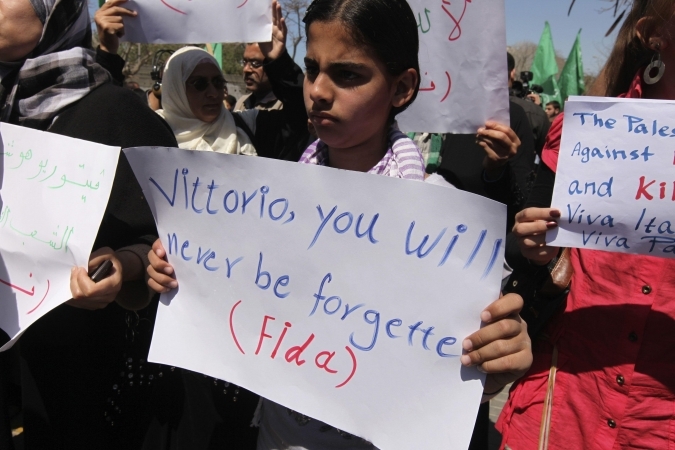 Vittorio was incarcerated in Ramle and soon after sent back home with nothing but the clothes on his body. Nevertheless, I cannot but be thankful to the press and television that have approached us with composure, that have ‘besieged’ our home with restraint, without excesses and that have given me the chance to talk about Vittorio and about his ideals and the choices he made. This lost child of mine is more alive than ever before, like the grain that has fallen to the ground and died to bring forth a plentiful harvest. I see it and hear it already in the words of his friends, above all the younger among them, some closer, some from afar. 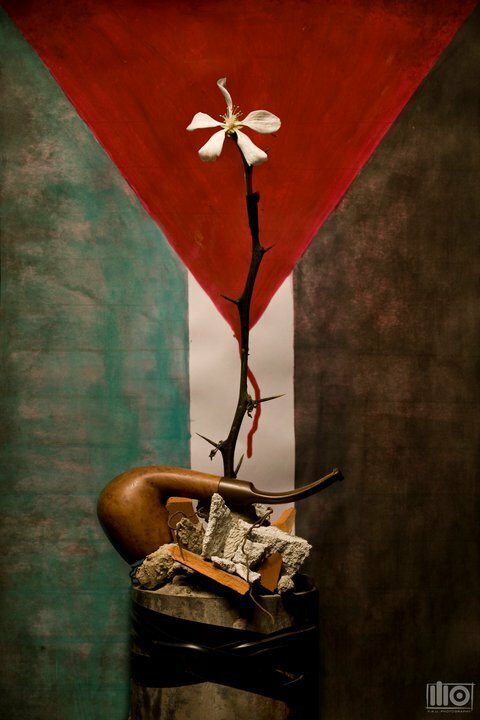 Through Vittorio, they have known and understood, and now even more, how one can give ‘Utopia’ a meaning, like the thirst for justice and peace, how fraternity and solidarity still stand and how, as Vittorio used to say, ‘Palestine can also be found at your doorsteps’. We were a long way from Vittorio, but now we are closer than ever, with his living presence magnified at every passing hour, like a wind from Gaza, from his beloved Mediterranean, blowing fierily to deliver the message of his hope and of his love for those without a voice, for the weak and the oppressed, passing the baton. As Monsignor Oscar Romero said, they may kill me but I will resurrect in the Salvadoran people. Thus with Vik. 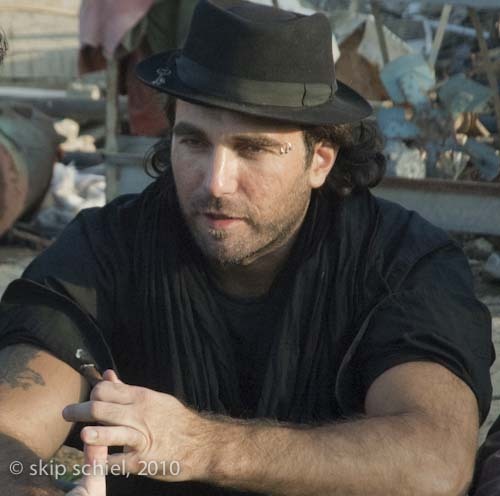 Vittorio Arrigoni Presente!